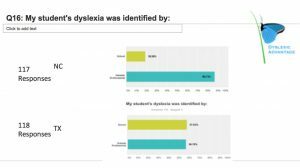 North Carolina trails other states in terms of its delivery of educational services to dyslexic students in the Dyslexia at School Survey conducted by Dyslexic Advantage. Compared to Texas, one of the earliest states to adopt dyslexia-specific legislation, North Carolina had abysmal statistics in terms of identification of students by schools (19% compared to Texas’ 58%) and a whopping 94% of North Carolina parents reported that their student’s teacher was unprepared to teach dyslexic students. Over half of parents reported that their students were not being provided with appropriate accommodations for their dyslexia. 78% percent of students were being given tests that their students couldn’t read. Rhode Island has a Dyslexia Teacher Training Law!